Small record labels fold more often than a vintage road map. The one out of a thousand that succeed usually are purchased or merged with larger labels and lose the very core of what made them unique. One amazing exception to this rule is PlasticMeltdown Records, spinning their magic for 33 1/3 years in San Clemente, CA, USA. PlasticMeltdown served as a home for a variety of artists, primarily in the blues/roots/folk area sometimes described as Americana music. Dennis Roger Reed recorded during nearly the entire history of the label, and Before It Was Before documents over 30 years of these recordings. There's rock, roll, blues, swing, country, bluegrass and a couple of other kinds of music that are difficult to label… And don't worry: PlasticMeltdown Records will return in Washington State, USA, sometime in the foreseeable future. Local singer-songwriter hero Dennis Roger Reed has built a four-album series of American roots songs that covers the landscape of a varied genre that is hard to pin down in a way that is cohesive. Since 1998, he has taken us on a road trip through history, crossing the borders among folk, rock, jazz, country, and blues. The timeline roughly begins during the early stage of Americana music movement that included Reed's friends and heroes, such as Steve Earle, Peter Case, and the Desert Rose Band. When the movement became a commercially established music category and moved to Nashville to be tamed, Reed kept exploring the roots of American music, mixing interpretations and originals into a series that plays like Nitty Gritty Dirt Bands' early Uncle Charlie album in concept and execution. 2018's Before It Was Before is the newest edition to Reed's series of American songs-original and skilled interpretations. To experience the Before It Was Before fully, a good sit-down-and-listen time should be spent with his first three releases: Little King of Dreams (1998), Cowboy Blues (2004), and Songs About Tractors and Stuff (2014) with Tim Horrigan. It is a front-porch album with a warmth that threads a diverse series of songs together into an enjoyable tapestry of American roots music. It has the feel of Reed's own meditation on the music that has shaped his life and the lives of most of his listeners. In a diverse anthological fashion it aptly sums up the work Reed has done over the last 30 years. In that sense, this 21-song record ties together the past with the present. The album's instrumental flare is driven by brother Don Reed whose music weaves through every track with some fine dobro and strings, along with backing vocals. His fiddle on the instrumental "Corrina" serves as fitting bookends for the song-cycle that spans three decades. Reed's vulnerability on "If Not For You," gives some added depth to the familiar Dylan song. "Jesus Is on the Mainline" is a fine tribute to gospel quartets of the deep south and Ry Cooder, who covered the song early in his career. Other standouts include "Up Until Now," "Big Sister," "Cuckoo," and the beautifully vulnerable and sincere song "Reconciliation." Most striking about this album is how well Reed's originals stand alongside the skilled interpretations of classic songs. 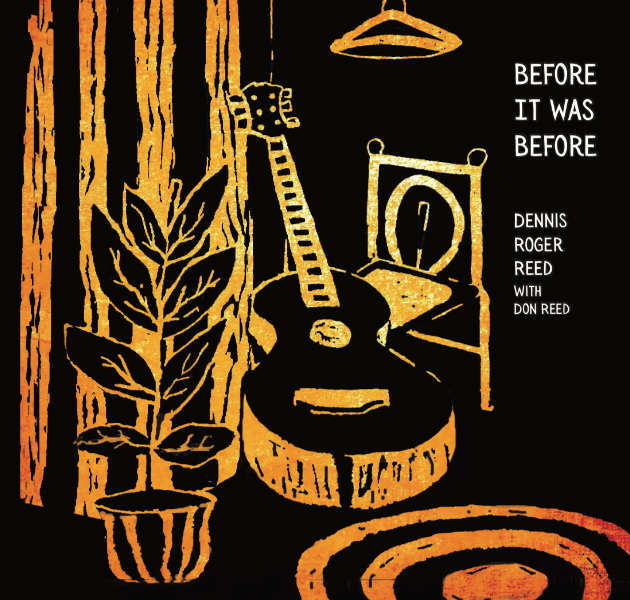 Before It Was Before is solid place to start if this is your first listen to Dennis Roger Reed. But, if you're already initiated, it's like walking into a familiar room warmed by a friendly musical fire. Dennis Roger Reed/Before It Was Before: With so many Dylan related songs and so much organic back porch picking, you could easily mistake this California guitar based record as being from Woodstock. Knowing his way around Dylan, blues, originals and more, this is one of those sweet albums you take very personally as its full blooded and speaks right from the heart—right to you. A tasty ride through the back country throughout. When the legendary Bob Dylan once defiantly proclaimed that the times, they are a changin', he was of course alluding to the youth-driven social and political movements in the 1960s. But that sentiment is just as relevant to the music business today, particularly its impact on our local music scene. No one better reflects these winds of change than Dennis Roger Reed, the longtime San Clemente resident, retired Beach and Parks Maintenance Manager and Americana singer-songwriter-guitarist who just weeks ago released his brand-new CD, "Before It Was Before" (PlasticMeltdown Records). A staple of the Orange County music community for over 25 years, Reed has shared his music with us as a solo performer, duo with his brother, Don Reed, and in several folk-roots-rock-blues bands including Blue Mama and Suitcase Johnnie. He also spent five years playing bass in the early-1990s with the Andy Rau Band, a progressive bluegrass outfit that recorded two albums for Turquoise Records. In addition, Reed pens Reed's Ramblings, a column for the Sherman Oaks-based online publication FolkWorks. I recently interviewed Reed at J.C. Beans Coffeehouse in Dana Point to discuss the current state of local music, including the challenges posed by the shrinking venues that showcase original live music; the transition to digital platforms and social media; and his ability to survive, if not thrive, in a profession that commercially prefers youth and trendy styles over authentic, timeless music. "Years ago, there were a lot more coffeehouses and bookstores hosting acoustic music, like Borders, Diedrich Coffee and the Gypsy Den (in both Costa Mesa and Santa Ana). If you were lucky, you could land a gig opening shows at the Coach House (San Juan Capistrano) or the Living Tradition Music Series (Anaheim.) But most of these have dried-up." "I've been playing (at) Alta for so many years now and I love it," said Reed between sips of coffee and bites of a bran muffin. "But the fact is, some of the venues pay one-fourth of what they did in the late-1980s/early-1990s. So it's obviously not something I do for the money." In fact, Reed gives away his older CDs for free and hopes to make up for it with contributions in his tip jar. Fast forward to "Before It Was Before." PlasticMeltdown Records, the indie label and recording studio that Reed has worked with/at for 25 years, recently moved away from its San Clemente location to Sequim, Washington, where it will re-open sometime in 2019. So as part of the big move's preparation, the label's owner, Brent Hoffenberg, began moving old audio files into the digital realm. Hoffenberg had been bugging Reed for over 20 years to finish a version of a song titled "The Cuckoo" that had been partially-recorded more than two decades ago. This lead to them working on a bunch of unfinished or unreleased tracks, mixing and tweaking new vocal and instrumental parts—plus adding five new Reed originals. The result is a terrific, 21-track recording (a double-album in the old days) featuring not only Reed's brother Don (lead electric guitar, mandolin, lap steel) but a slew of other talented sidemen, including Chris Darrow (fiddle and lap steel), Mike Dowling (resonator guitar), Tim Horrigan (organ) and Don Segien (acoustic lead guitar), among others. There's no denying the energy and camaraderie that bubbles to the surface throughout this eclectic mix of roots, country, swing, blues, bluegrass and rock. But will "Before It Was Before" find its audience and be financially viable? "Well, being a musician is just not as lucrative as it used to be," insists Reed with a sigh. "It's kind of like society in general, where you're either on the low or top end of the class divide. There's not much in-between. The number of people making a living as a full-time musician sadly keeps shrinking." Reed adds that the marketing model has completely changed. "Most people today, except for the audiophiles, aren't that interested in the sequence of songs or the sound quality. Consumers can listen to songs in advance before buying, so why buy a CD when you can get digital MP3's individually and cheaper, even though you lose the high- and low-end sound quality?" Bear in mind that Reed is 66-years-old and has described himself as being, at times, an Old Man Ranting. "I don't use social media but I do have a revamped website," said Reed, who added that he's guilty of not taking his own advice shared in a prior FolkWorks column urging musicians to be more social media-savvy. Although he also sends email updates to fans and friends who've signed up for his mailing list of live gigs, Reed still prefers the old-school method of mailing out promo CDs, photos, etc. to radio stations, music critics, booking agents and other supporters of independent roots music. What motivates Reed–who was born in Pasadena and moved to San Clemente in 1978 after attending Cal-State Fullerton–to keep performing and recording new music that yields diminishing financial returns? "There's a difference between making money and earning the recognition of your peers," said Reed, who has garnered positive reviews of his CDs from as far away as Belgium and had his songs played on the airwaves in both Canada and Australia. "It means a lot when you open a show for someone like Don Dixon and Marti Jones (at the Coach House in the late-1990s) and they walk up to you later and say how much they enjoyed your set. Things like that make it all worthwhile." A little perspective on one's life doesn't hurt any, either. "The past couple of weeks were personally challenging for me," said Reed. "A friend of mine has cancer, and my son smashed up his car and quit his new job. So it's been stressful. But I love what I'm doing and will wake up tomorrow morning, brush my teeth and then start my day." The new CD, Before It Was Before, is wonderful and I'm very honored by Dennis including my song "Back On the Street Again." It turned out very nicely. Lots of nice instrumental fireworks, it rocks! I was especially impressed by the originals, and pleasantly surprised by the Country Swing "In Western Skies." Very nice. "Up Until Now" and "I Had To Ride" and "Reconciliation" are all excellent, I love the gunfighter ballad, good stuff. "Big Sister" too, great idea and treatment. The renditions of the chestnuts are also very satisfying. The production is very fine and fresh and over all the work is terrific. The vocals come off very well too. It's a warm and honest voice, intimate and engaging. Nice to hear Michael Gardner and Chris Darrow, too. The quality of musicianship is excellent without losing that good-time band feel. Hey, thank you so much for the great surprise—your cover of my song "River of Love." I really like it—you made it your own while keeping the basics of the tune. I like the rest of your album too. Thanks again for covering it and sending me your version. "A sprawling retrospect of 30+ years of recording at PlasticMeltdown Studios…"
Dennis Roger Reed (DRR) is a musician and a member of several bands, but also performs solo. Also in style, this man from Orange County is very versatile. He plays blues, folk, bluegrass and country-rock. He writes his own songs, sings them and is a multi-instrumentalist (guitars, mandolin, bass). As sequel to 'Songs About Tractors and Stuff'  (a clever mix of 17 sung and instrumental songs, with covers and originals, recorded with two different backing bands) this is a sequel, a fourth studio album 'Before It was Before' ', which was released by PlasticMeltdown Records. 'Before It Was Before' is, given the number of tracks (read: twenty-one!) a "double album". With the help of his brother Don, a long line of musicians and producer (and studio owner) Brent Hoffenberg, DRR recorded some blues, some bluegrass, some country rock, folk, western swing, a few originals and a handful of old songs. This is indeed as the title says: "before it was…", because PlasticMeltdown Records, which DRR has worked with for over twenty-five years, is planning to leave California and move to the North. "It starts off folk, and ends up folk rock…"
In view of the upcoming move of PlasticMeltdown Records many old recordings have already been digitized. Some recordings were on analogue tapes and most of them were projects which, for some reason, had not been completed. Some recordings were already mixed, so that control of the individual tracks and instruments was no longer available. In summary: CHALLENGE! One of the songs that had been on the "to do" list of DRR for twenty years was a recording of the traditional "The Cuckoo", recorded earlier around 1980 - 1990. Banjo, bass, guitar and vocals were recorded and the song had different things are added. A new "extra" bass was added to the bass first, because the original bass part could not be deleted. Then the drum part, violin, harmonica and 12 string guitar. Everything would be matched in the mix. The older material clearly caused more problems. How does a 66-year-old voice sing harmony with a 35-year-old? Yes, with the right attitude and… knowledge. Can a badly tuned guitar be camouflaged by another guitar or other instrument, without sounding like it was added to cover flawed guitar playing? Except for two songs, which required too much work, the assignment succeeded. The album 'Before It Was Before' came to an end and the result is certain. Pearls (traditionals reworked by DRR) such as "Corina", "Jesus Is on the Mainline", "Dark Hollow" and "Swing Hollow" (with Chris Darrow on lap steel and Mike Dowling on resonator guitar) survived the digital transformation and came out as reborn. A selection from the covers from Bob Dylan: "If Not For You" and "One Too Many Mornings", by Lee Hazlewood "I'd Rather Be Your Enemy", from Steve Gillette "Back on the Street Again (the vuelta and la calle otra vez)" and from Shirley & Bobby Womack "It's All Over Now ". Something about the new songs. DRR chose five for the project: the trailing campfire rocker "In Western Skies", "Big Sister", the handsome folky ballad "Up Until Now" (with Don Segien on acoustic guitar), "I Had to Ride" and the beautiful love song "Reconciliation ". Dennis Roger Reed and Brent Hoffenberg succeeded in a big challenge. 'Before It Was Before' is a great compilation of roots traditional songs, old work and new work. Let the moving vans come because there is already a lot of digitized what had to be saved! "Dennis Roger Reed and Brent Hoffenberg succeeded in a big challenge. 'Before It Was Before' is a great roots compilation or tradition, old work and new work. The move out of California can start!…"
Before It Was Before is a compilation from singer/multi-instrumentalist Dennis Rogers Reed, with the album documenting 30 years of recording for label/studio Plasticmeltdown. The previously unreleased tracks rely heavily on covers and include lots of Americana staples, from country to bluegrass to folk to blues. At 21 tracks, the album clocks in at over an hour. Reed considers it a double album but for some genres, this would be almost a triple one. The performances are all impressive. Reed, here frequently collaborating with his brother Don, has a tight band that does a great job of supporting his pleasant voice. Reed comes out of a coffeehouse musical culture and the album reflects that. The music is low-key and even-keeled. Reed isn't trying to mine the depths of his psyche, he's trying to create and re-create enjoyable moments. There are many successful such moments on the album. On the classic "Jesus on the Mainline," Reed and his brother re-work the song as an expansive, beautiful bluegrass near-instrumental with waves of accordion and mandolin. The song fades out as suddenly as it begins, making you wonder if you actually heard it. Reed also takes on the Rolling Stones' "It's All Over Now," taking a British band that flirted with American country music straight into country, almost like an alternate reality where the Stones were born in the South. Reed gives the listener a lot to hear, but at a certain point, it's overwhelming. There's a lot of solid music on the album, but it doesn't feel particularly organized. A tighter sequencing around originating artist or genre—or perhaps both—might have made things feel more cohesive. Before It Was Before has some nice performances, but it also feels more random than planned. Late-2018 discs among the year's best. While 2018 will soon be over, a number of must-hear albums have just been released and are well worth exploring. With an artistic spirit directed at the strength of a song rather than its specific genre, singer-songwriter Dennis Roger Reed and his brother Don Reed have crafted a freewheeling album (Before It Was Before) mixing up originals and covers spanning country-western, folk, western swing, blues and even a bit of bluegrass. There is an intimacy and warmth across the 21-track collection with ballads and uptempo cuts exuding an inviting touch. The driving "I Had to Ride," affecting "Reconciliation," and country ballad "Up Until Now" all wonderful Reed-penned originals. Among the joyful covers is a countrified take on Bob Dylan's "If Not For You," a reflective reworking of Michael Hall's "River of Love," an artful reading of the traditional instrumental "Corrina Corrina" and a country rock version of Randy Meisner's "Hearts on Fire."